These Crossed volumes keep coming thick and fast. Eleven books and a spin off series are the worst thing for a visceral horror title. The franchise is a victim of its own success. The Crossed appear smarter and with a larger vocabulary as time goes on and consequently less threatening. There are two stories here and both of them are based around a single idea padded out beyond their means. Even the great Si Spurrier, despite featuring one of the rare non-white protagonists we have seen to date, builds his story around a solitary groan-inducing punchline. He does introduce blank prose into his tale which, whilst not spinning out the length any more, does feel at odds with the snappy run-for-your-life feel that most Crossed stories have. Newcomer Jordan makes a brave first attempt with a pair of female characters that aren’t helpless but don’t really develop. They are just a vehicle to deliver you to his (not so) grand finale and for the artist to put in a bit too much T&A for you to feel comfortable with. The art is fair and along with the colouring certainly isn’t lazy but we have seen it all before. The lettering in the Jordan story could have done with something to help the reader identify when the narrator changes, or is that just us getting lazy. They aren’t bad stories but the franchise as a whole now feels saggy and deflated. But we still can’t get enough of our Technicolor penny-dreadful so it’s a Thumbs Up! 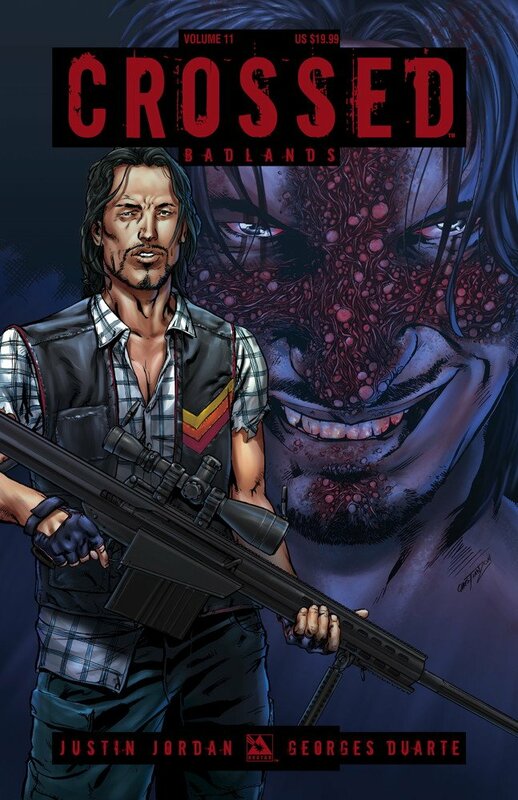 This entry was posted in Graphic Novel and tagged Justin Jordan, Simon Spurrier, Thumbs Up! by 365gn. Bookmark the permalink.